Our Abpromise guarantee covers the use of ab102692 in the following tested applications. WB 1/100 - 1/500. Predicted molecular weight: 79 kDa. IHC-P 1/50 - 1/100. 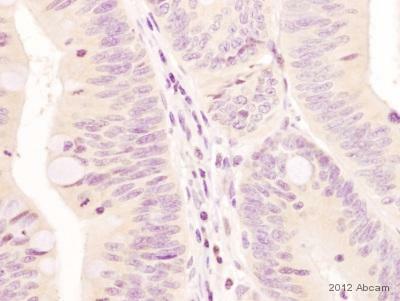 Perform heat mediated antigen retrieval before commencing with IHC staining protocol. (heat-mediated/Sodium citrate pH 6). The hemerythrin-like region acts as an oxygen and iron sensor by binding oxygen through a diiron metal-center. 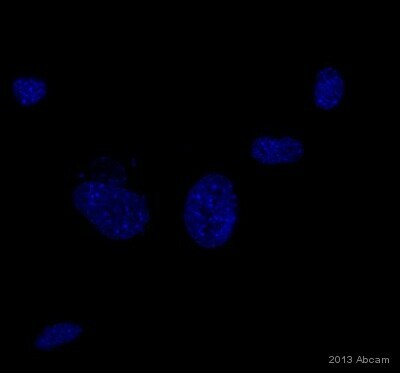 In absence of oxygen and iron, the protein is ubiquitinated and degraded. Ubiquitinated upon iron and oxygen depletion, leading to its degradation by the proteasome. Ubiquitination is regulated by the hemerythrin-like region that acts as an oxygen and iron sensor. 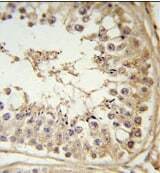 Immunohistochemical analysis of FBXL5 in formalin fixed, and paraffin embedded testis tissue using 1/50 ab102693 followed by peroxidase conjugation of the secondary antibody and DAB staining. Publishing research using ab102692? Please let us know so that we can cite the reference in this datasheet.